As we celebrate Black History Month, one figure who was a trailblazer in the game of baseball died today at the age of 83. 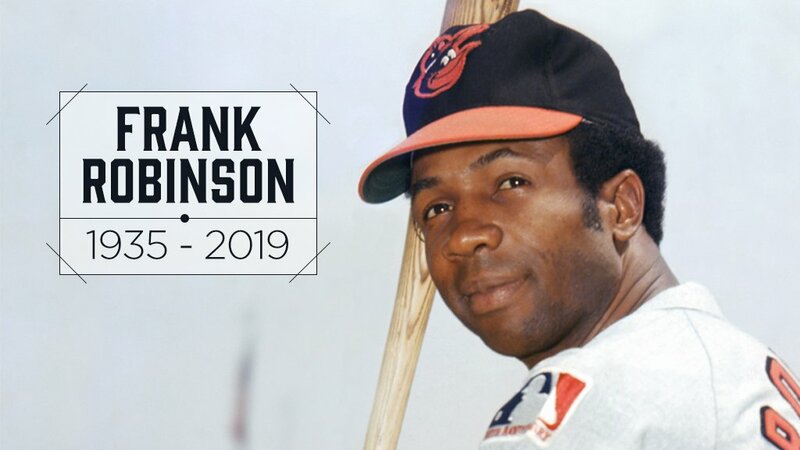 Frank Robinson, who was born in Beaumont, Texas, was a World Series champion, finished his baseball career with 586 career home runs, and led the way for minorities in management in the game. At the age 20, Robinson was rookie of the year for the Cincinnati Reds in 1956, which began a 21-year career in which he played for five teams and became the first to win the MVP award in both leagues. The Cleveland Indians gave Robinson his chance at managing in 1975 when they made him player-manager and gave him the distinction as the first black manager in the Major Leagues. He earned the AL’s Manager of the Year Award in 1989 after leading the Baltimore Orioles, which famously lost its first 21 games the year prior to an 87-win season. At his Hall of Fame induction in 1982, Robinson paid homage to Baltimore, Memorial Stadium and its fans. Plans for funeral arrangements were not immediately announced. In lieu of flowers, his family suggests donations in Robinson’s name to the National Civil Rights Museum in Memphis or the National Museum of African American History & Culture in Washington, D.C. The NFL Super Bowl has been good for one local high school – John Jay. Since the news broke that the LA Ram’s No. 83 Josh Reynolds gradated from the Northwest school, media has been flocking to the school’s doors. It also helps that Reynolds’ mother, Michelle, is an assistant principal there. Josh Reynolds, a wide receiver for the Rams, graduated from Jay High School where he played football, basketball and ran track. After high school, he played for Tyler Junior College and found his way to Texas A&M University. He was drafted in 2017 by the Rams. In San Antonio – a city that has produced many top-notch football players, Reynolds’ name is gold. Malcolm Brown, a graduate of Steele High School in Cibolo, is a running back for the Rams, but he’s on the injured reserve list. He’s been with the Rams since 2015 after playing for the University of Texas. Ramon Richards graduated from Brackenridge High School in 2014. He played for Oklahoma State and was signed by the Rams last year. He’s on the team’s practice squad. As the Rams face the New England Patriots in the Super Bowl this Sunday, most of the Jay community will be rallying behind its former student. The school is so excited they made a No. 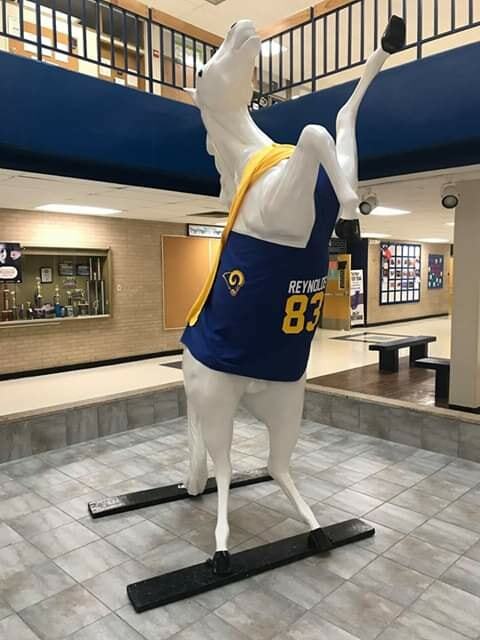 83 jersey for their Mustang mascot. Seven prominent sports figures from San Antonio ISD’s will be inducted into the fourth annual SAISD Athletic Hall of Fame during a special ceremony to be held in their honor on Aug. 25. Master of ceremonies will be Gary DeLaune, a legendary TV and Radio newsman whose career spans nearly 60 years in broadcasting. Following their induction, bronze plaques commemorating the honorees will be on permanent display at the east visitor’s entrance of Alamo Stadium. Fennis Dembo – an All-State basketball player at Fox Tech HS. This 1984 graduate starred at point guard. Dembo helped lead his high school team to the UIL state semi-finals in 1984. He played college basketball at the University of Wyoming. He rose to stardom, becoming the Cowboys all-time leading scorer and rebounder in school history. He accumulated 2,311 points and 954 rebounds in four years at Wyoming. He helped lead the team to the Sweet Sixteen of the 1987 NCAA Men’s Division I Basketball Tournament. At the 1987 NCAA Tournament, Dembo was the leading scorer averaging 27.8 points a game. He was drafted into the National Basketball Association and helped the Detroit Pistons win the 1989 NBA championship. Tai Dillard – a 1999 Sam Houston HS alum who was an All-State and All-City basketball player. She was a star shooting guard and helped lead Sam Houston to back-to-back UIL state basketball championship tournament appearances in 1998 and 1999. She played college basketball for four seasons at the University of Texas at Austin (1999-2003). She was a two-time Big 12 All-Academic honoree and she was named to the Big 12 Commissioner’s Honor Roll five times. Dillard went on to play in the inaugural season for the San Antonio Silver Stars of the Women’s National Basketball Association in 2003. She played for the Silver Stars from 2003-2005. After her playing career ended, she became a high school and college women’s basketball coach. Dolores “Delo” Dyer – regarded as a pioneer in high school girls athletics. She coached volleyball for 16 seasons at Jefferson HS and built a winning dynasty for the Mustangs. Dyer became the first-ever volleyball coach for Jefferson in 1972 when the UIL officially recognized volleyball as a championship sport. In her coaching career, she amassed an incredible 410-80 overall record for a winning percentage of .837, the winningest percentage for volleyball in San Antonio history. Dyer guided the Lady Mustangs to nine straight league championships. In 1979, she led her Mustangs to the UIL state championship finals against Cypress Creek HS. Jefferson won an amazing 92 straight district matches between 1978-1984 under Dyer. Darryl Baris Grant – a star offensive and defensive lineman for the Highlands HS football team. The 1977 graduate played college football at Rice University. In 1981, he was drafted by the Washington Redskins in the National Football League. Grant helped the Redskins make the playoffs six times, including three trips to the Super Bowl (two wins) and four conference championship appearances (three wins). He is best remembered for his 1983 NFC Championship game against the Dallas Cowboys, where he intercepted a pass for a 10-yard touchdown. Grant played in 141 games for the Redskins from 1981-1990, finishing with 27 sacks and two interceptions. His best season was in 1984 when he recorded a career-high eight sacks. Clifford Johnson – a 1966 graduate of Wheatley High School and a standout athlete in baseball, football, basketball and track. He was the star catcher for the Wheatley Lions in his senior year. In 1966, he was drafted into professional baseball by the Houston Astros. After six seasons in the minor leagues, he made his major league debut for the Astros in 1972. He played catcher, first base and outfield in the early part of his professional career before becoming primarily a full-time designated hitter. Johnson played a total of 15 years and for seven different teams in Major League Baseball. Two of those seasons, he helped the New York Yankees win back-to-back World Series championships in 1977 and 1978. David Vela – a 1979 Burbank HS alum, who was an All-City football player and was named to the 1970’s All-Decade high school football team by the San Antonio Express-News. He helped lead his Burbank Bulldogs to the school’s only undefeated regular season at 10-0 in 1978. He was a Little All-American football player at Southwest Texas State University in San Marcos, now called Texas State University. He set a school record in most receiving yards and touchdown receptions in 1981, a record that stood until 2008. With Vela, the Bobcats won two National Division II Football Championships in 1981 and 1982. He played professional football for the Oakland Raiders (National Football League) and San Antonio Gunslingers (United States Football League) from 1983-1986. Julius Whittier – a 1969 Highlands HS graduate who was a star football player and team captain. He made an historical impact by becoming the first African American to ever letter in football at the University of Texas at Austin. He played offensive tackle and tight end for the Longhorns. He helped the team win three Southwest Conference championships (1970, 1971 and 1972) and one National Division I Championship in 1970. Following college graduation, he earned a graduate degree at the LBJ School of Public Affairs in 1976 and completed a law degree. 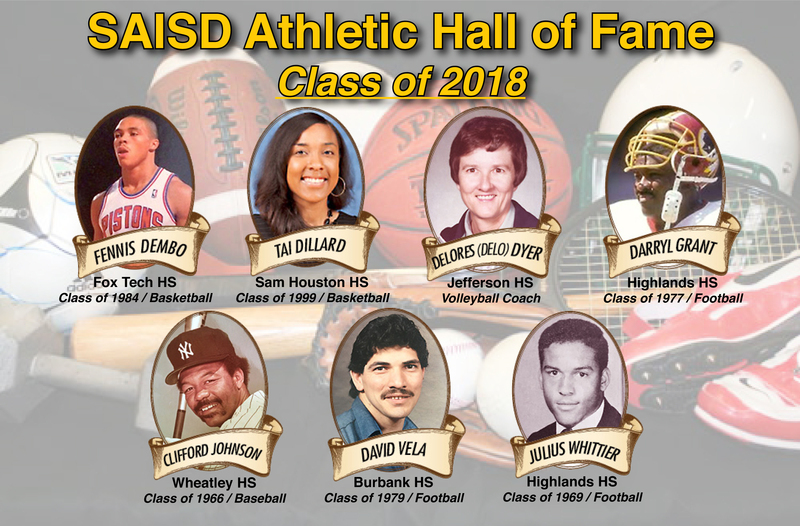 Each year, the SAISD Athletic Hall of Fame honors alumni who have made a positive impact in sports, either through excellent athletic achievements or excellent athletic program contributions. In addition to outstanding athleticism, inductees were chosen for their distinction and excellence to the District by their conduct both on and off the field, or court, of competition. Nominations for the class of 2018 were received this past year and selection was made by a committee. The SAISD Athletic Hall of Fame is sponsored by the SAISD Athletic Department and receives support from the SAISD Foundation. For more information, go here: www.saisd.net/athletichalloffame2018. 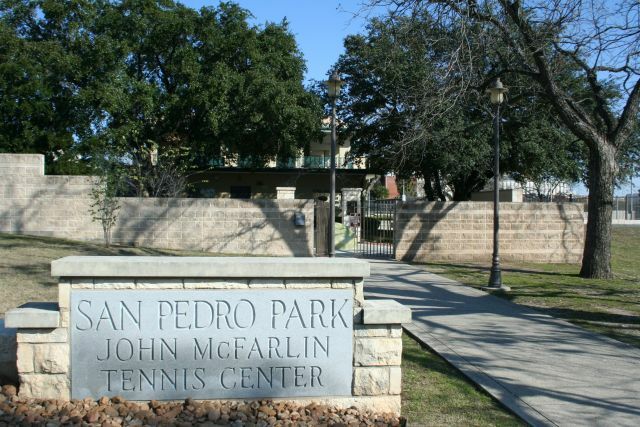 The McFarlin Tennis Center, centrally located in San Pedro Springs Park, has been recognized as a 2018 United States Tennis Association (USTA) Outstanding Facility award winner, according to the San Antonio Parks and Recreation. The McFarlin Tennis Center is one of 24 winners in the 37th annual USTA Facility Awards program, which recognizes excellence in the construction and/or renovation of tennis facilities throughout the country. As the result of almost half a million dollars combined investments in 2016 from the San Antonio Parks and Recreation Department, San Antonio Tennis Association Inc. (SATA Inc.) and the McFarlin Tennis Foundation, there have been many facility renovations and upgrades to the award winning facility. The McFarlin Tennis Center hosted 16 tennis tournaments in the year 2017, with approximately 5,900 players participating. It has hosted top events such as the 2016 Texas CTA of the Year and the 2016 San Antonio Open, a women’s professional WTA 125K Event. “Our ongoing partnership with the McFarlin Foundation and SATA enables the San Antonio Parks and Recreation Department to support the game of tennis throughout the City of San Antonio, nationally and around the globe,” said Xavier Urrutia, director of San Antonio Parks and Recreation. McFarlin Tennis Center offers 22 lighted hard courts with pro shop, lockers, showers and a variety of services. Courts can be reserved for corporate tennis events and open tennis play. Year-round programs include tennis lessons, camps, clinics, tournaments and leagues. The McFarlin Tennis Center will be honored at the USTA Semi-annual Meeting at the Grand Hyatt Hotel in New York City on Aug. 30.